3. A postcard sent to Marcel and Jan Hajsky by their mother, Anna (Goldstein) Hajsky, from the Theresienstadt concentration camp. 5. STILL PHOTOGRAPH FROM THE NAZI PROPAGANDA FILM, "Der Fuehrer Schenkt den Juden eine Stadt" [The Fuehrer gives the Jews a City]. Jews watching a performance in the Theresienstadt ghetto. 7. Verso of an identification card issued in the Theresienstadt concentration camp to Gustav Porges. 8. STILL PHOTOGRAPH FROM THE NAZI PROPAGANDA FILM, "Der Fuehrer Schenkt den Juden eine Stadt" [The Fuehrer gives the Jews a City]. Karel Ancerl conducts the Theresienstadt orchestra. 13. STILL PHOTOGRAPH FROM THE NAZI PROPAGANDA FILM, "Der Fuehrer Schenkt den Juden eine Stadt" [The Fuehrer gives the Jews a City]. 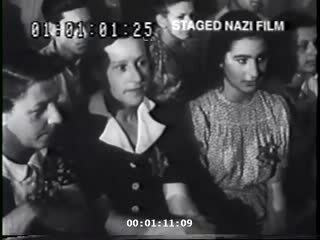 Jews watching a performance in the Theresienstadt ghetto. 16. STILL PHOTOGRAPH FROM THE NAZI PROPAGANDA FILM, "Der Fuehrer Schenkt den Juden eine Stadt" [The Fuehrer gives the Jews a City]. Prisoners sitting outside watch an outdoor event at the Theresienstadt concentration camp. 17. Identification card issued in the Theresienstadt concentration camp to Gustav Porges. 18. STILL PHOTOGRAPH FROM THE NAZI PROPAGANDA FILM, "Der Fuehrer Schenkt den Juden eine Stadt" [The Fuehrer gives the Jews a City]. Portrait of Professor Emil Utitz, a prisoner in the Theresienstadt ghetto. 21. STILL PHOTOGRAPH FROM THE NAZI PROPAGANDA FILM, "Der Fuehrer Schenkt den Juden eine Stadt" [The Fuehrer gives the Jews a City]. Portrait of an elderly Jewish man sitting in an audience in the Theresienstadt ghetto. 22. Unauthorized Salvadoran citizenship certificate issued to David Samson Goldschmidt (b. September 24, 1892 in Hamburg) and his wife Ketty Sarah (nee Felsenstein) Goldschmidt (b. July 11, 1896 in Leipzig) by George Mandel-Mantello, First Secretary of the Salvadoran Consulate in Switzerland and sent to him in them in Theresienstadt. 23. STILL PHOTOGRAPH FROM THE NAZI PROPAGANDA FILM, "Der Fuehrer Schenkt den Juden eine Stadt" [The Fuehrer gives the Jews a City]. Jews watching a performance in the Theresienstadt ghetto. 25. STILL PHOTOGRAPH FROM THE NAZI PROPAGANDA FILM, "Der Fuehrer Schenkt den Juden eine Stadt" [The Fuehrer gives the Jews a City]. Jews watching a performance in the Theresienstadt ghetto. 26. STILL PHOTOGRAPH FROM THE NAZI PROPAGANDA FILM, "Der Fuehrer Schenkt den Juden eine Stadt" [The Fuehrer gives the Jews a City]. View from above of a woodworking factory in the Theresienstadt ghetto. 27. STILL PHOTOGRAPH FROM THE NAZI PROPAGANDA FILM, "Der Fuehrer Schenkt den Juden eine Stadt" [The Fuehrer gives the Jews a City]. Portrait of an elderly Jewish man in the Theresienstadt ghetto. 28. Unauthorized Salvadoran citizenship certificate issued to Elsa (Falkenfeld) Kahn (b. October 12 1880, Schwerin, Germany) by George Mandel-Mantello, First Secretary of the Salvadoran Consulate in Switzerland. 29. A Czech Jew at forced labor clears blocks of ice in the center of Prague. 30. A postcard sent to Marcel Hajsky by his uncle, Rudolf Goldstein, from the Theresienstadt concentration camp. 32. STILL PHOTOGRAPH FROM THE NAZI PROPAGANDA FILM, "Der Fuehrer Schenkt den Juden eine Stadt" [The Fuehrer gives the Jews a City]. Jews watching a performance in the Theresienstadt ghetto. 33. Jewish prisoners in Theresienstadt march in file into a building. 34. STILL PHOTOGRAPH FROM THE NAZI PROPAGANDA FILM, "Der Fuehrer Schenkt den Juden eine Stadt" [The Fuehrer gives the Jews a City]. Karel Ancerl conducts the Theresienstadt orchestra. 35. Unauthorized Salvadoran citizenship certificate issued to Isaak Herzberg (b. June 22, 1887, Poland) and his daughter, Berta Herzberg (b. September 25 1931, Vienna, Austria) by George Mandel-Mantello, First Secretary of the Salvadoran Consulate in Switzerland. 36. A Jewish female prisoner works as a nurse in a clinic in the Hamburger caserne in Theresienstadt. The photograph was taken in connection with the Red Cross visit to Theresienstadt. 37. STILL PHOTOGRAPH FROM THE NAZI PROPAGANDA FILM, "Der Fuehrer Schenkt den Juden eine Stadt" [The Fuehrer gives the Jews a City]. Portrait of an elderly Jewish man sitting in an audience in the Theresienstadt ghetto. 39. STILL PHOTOGRAPH FROM THE NAZI PROPAGANDA FILM, "Der Fuehrer Schenkt den Juden eine Stadt" [The Fuehrer gives the Jews a City]. Jews watching a performance in the Theresienstadt ghetto. 40. STILL PHOTOGRAPH FROM THE NAZI PROPAGANDA FILM, "Der Fuehrer Schenkt den Juden eine Stadt" [The Fuehrer gives the Jews a City]. 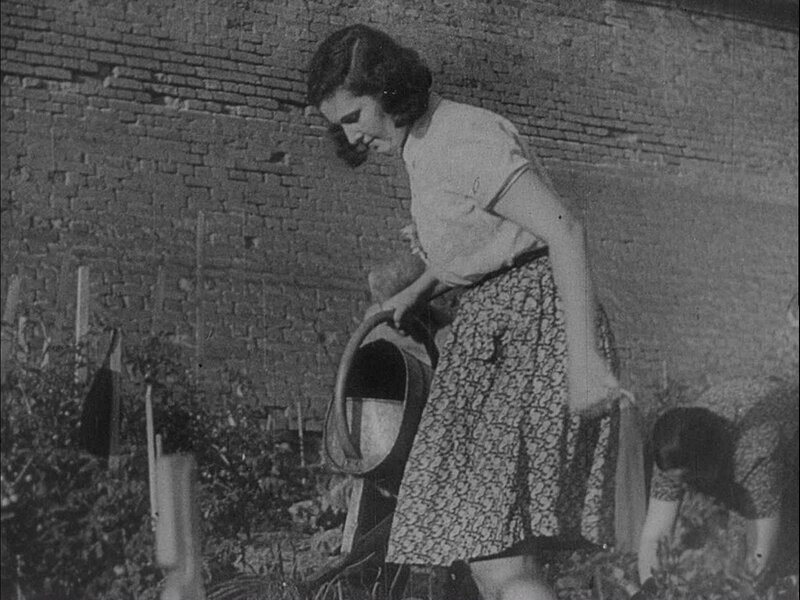 Theresienstadt inmates working in the SS vegetable gardens. 41. STILL PHOTOGRAPH FROM THE NAZI PROPAGANDA FILM, "Der Fuehrer Schenkt den Juden eine Stadt" [The Fuehrer gives the Jews a City]. Portrait of a Jewish man sitting in an audience in the Theresienstadt ghetto. 42. STILL PHOTOGRAPH FROM THE NAZI PROPAGANDA FILM, "Der Fuehrer Schenkt den Juden eine Stadt" [The Fuehrer gives the Jews a City]. Portrait of a young Jewish woman reclining outside with a book in the Theresienstadt ghetto. 43. STILL PHOTOGRAPH FROM THE NAZI PROPAGANDA FILM, "Der Fuehrer Schenkt den Juden eine Stadt" [The Fuehrer gives the Jews a City]. Jewish spectators at a soccer game in the courtyard of the Dresden barracks in the Theresienstadt ghetto. Pictured is Bedrich Fluss. 44. STILL PHOTOGRAPH FROM THE NAZI PROPAGANDA FILM, "Der Fuehrer Schenkt den Juden eine Stadt" [The Fuehrer gives the Jews a City]. Jews watching a performance in the Theresienstadt ghetto. 47. STILL PHOTOGRAPH FROM THE NAZI PROPAGANDA FILM, "Der Fuehrer Schenkt den Juden eine Stadt" [The Fuehrer gives the Jews a City]. Street scene in Theresienstadt. 48. Unauthorized Salvadoran citizenship certificate issued to Leopold Spangenthal (b. June 18 1893, Spangenberg, Germany) and his wife, Hedwig (Adler) Spangenthal (b. June 20 1895, Kassel, Germany) by George Mandel-Mantello, First Secretary of the Salvadoran Consulate in Switzerland. 50. STILL PHOTOGRAPH FROM THE NAZI PROPAGANDA FILM, "Der Fuehrer Schenkt den Juden eine Stadt" [The Fuehrer gives the Jews a City]. Jewish prisoners sitting in an audience in the Theresienstadt ghetto.